When we think of modern crocodiles and their relatives, the image of an aquatic animal that is relatively slow-moving on land typically comes to mind. However, the animals that we know today are but one small (and highly specialized) part of a much larger and more diverse group of animals, most of which were better suited to life on dry land. Land-based crocodylomorphs, the archosaur group which contains modern crocodilians and their extinct relatives, were very common throughout the Mesozoic Era and were incredibly diverse with a wide array of morphologies, families, and many species between them. Despite experiencing a considerable drop in diversity at the end of the Cretaceous, crocodylomorphs were among the first animals to take over the terrestrial predator niches that were left vacant by the theropod dinosaurs. As the Cenozoic Era progressed, competition from placental mammals has largely discouraged the long-term success of these animals on the continents of North America, Eurasia, and Africa. However, these predators remained prominent components of the fauna on the island continents of South America and Australia. Planocranids appear in the fossil record immediately after the Cretaceous-Paleogene extinction event. They were a rather short-lived family with a temporal range spanning the early Paleocene to the middle Eocene. Closely related to modern crocodiles, these animals inhabited Eurasia and North America. They gradually faded into extinction as mammalian carnivores were becoming more diverse. In their heyday though, they were major predators of the small to mid-sized mammalian herbivores with which they coexisted. Three genera are currently recognized; Planocrania, Boverisuchus, and Pristichampsus. (top) and Planocrania rollinattii (bottom). Mekosuchines had a much longer run than the earlier planocranids, having existed from the Eocene all the way into the Holocene where they briefly coexisted with humans as recently as 3,000ya. These animals were closely relatives of modern crocodiles and are grouped as a clade within the family Crocodylidae. Their fossils mostly occur in Australia and its nearby islands. The group's longevity may be due to the absence of placental mammals in these regions. Most of them appear to have been at least partly aquatic. Others, such as Mekosuchus and Quinkana, evolved to become fully terrestrial. The latter of the two genera was once mistakenly interpreted as a late-surviving planocranid by early researchers. Quinkana fortirostrum (bottom) from Pleistocene Australia. 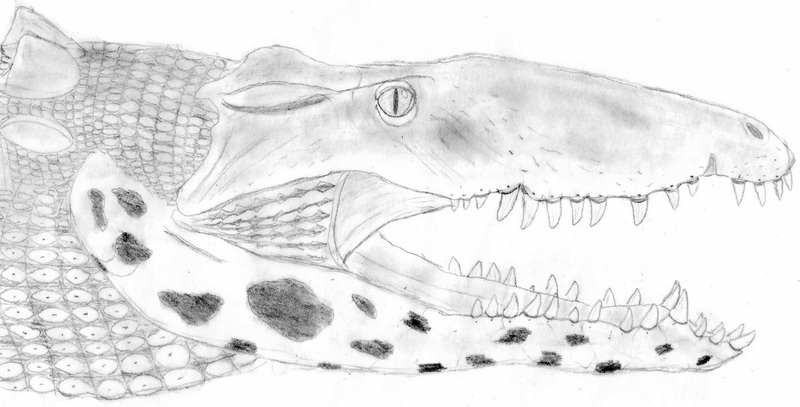 The sebecosuchians were part of a much more diverse, mostly Gondwanan* group of crocodylomorphs known as the Notosuchia, which first appear in the fossil record during the early Cretaceous. The sebecosuchians comprise two families; the late Cretaceous Baurusuchidae, and the Cenozoic Sebecidae which we will be focusing on in this blog. Sebecids were a successful group that lasted from the early Paleocene (66mya) to the middle Miocene (11mya). They were an exclusively South American family that, together with the sparassodont marsupials and phorusrhacid birds, formed an important part of the predator community on that continent. Restored head of Sebecus icaeorhinus, a Sebecid. Living crocodilians are renowned aquatic predators that are typically more at home in the water than the land. However, the affinity these animals have to water varies between the species and some do have adaptations that make them better adapted for terrestrial locomotion. The Cuban Crocodile (Crocodylus rhombifer) evolved on the Caribbean islands where it had little or no competition from mammalian predators. It is one of the largest endemic carnivores in the region second only to the American Crocodile (Crocodylus acutus). Compared to others within its family, it has brighter adult coloration, larger teeth, rougher skin, longer legs, and reduced webbing between its toes. Though still amphibious by nature, it spends much more of its time on land than other crocodiles and it runs and leaps very well. Fossil evidence shows that these crocs once fed on extinct ground sloths, and the above attributes would have enabled them to hunt these animals on land. In fact, a colony of this species at Gatorland, Florida has exhibited possible pack-hunting behavior which could have helped it hunt such extinct megafauna. 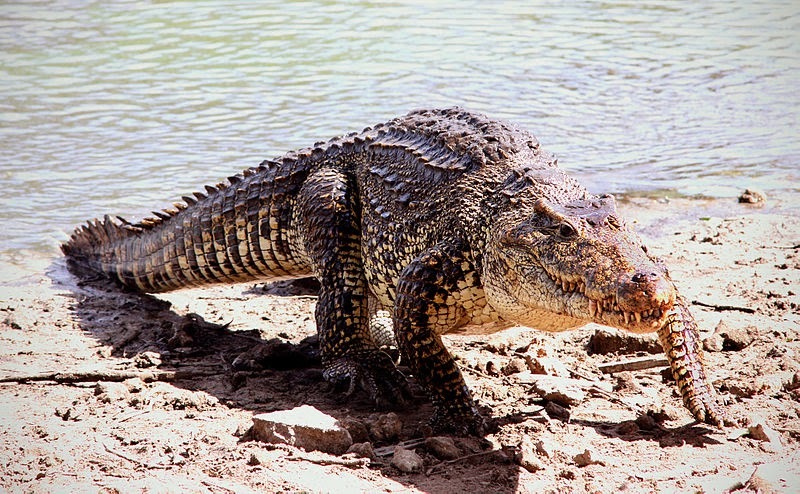 Other extant crocodilians are also known to hunt cooperatively, which raises implications into what hunting methods the extinct species above were capable of. 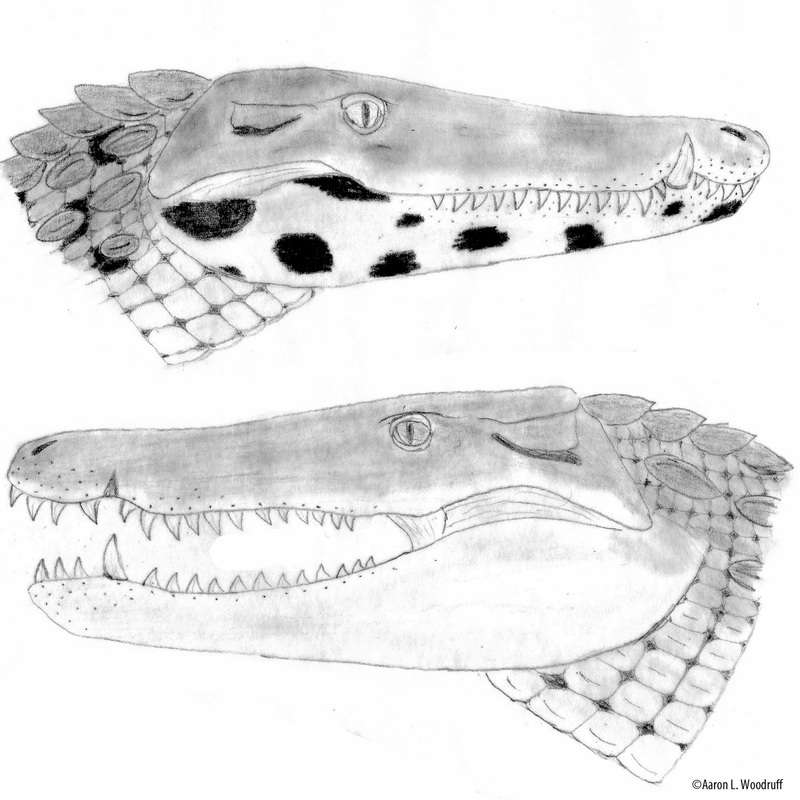 Another island crocodile, the extinct Horned Crocodile (Voay robustus) of Madagascar, exhibited characteristics that would have made it well-suited to terrestrial life. Compared to the Cuban Crocodile, this species had even more robust limbs, a shorter, deeper snout, and lower, more anteriorly-facing nostrils. On an island with few mammalian predators, this crocodile was one its top predators. It only became extinct after humans arrived a few thousand years ago. Brochu CA (2007). “Morphology, relationships, and biogeographical significance of an extinct horned crocodile (Crocodylia, Crocodylidae) from the Quaternary of Madagascar”. Zoological Journal of the Linnean Society 150(4): 835-863. Wonderful illustrations! I like a lot these terrestrial crocodyliforms, specially the sebecids. Only a observation: the osteoderms of sebecids were small and reduced to two rows in the back, like in their baurusuchids relatives. Cheers! 1. 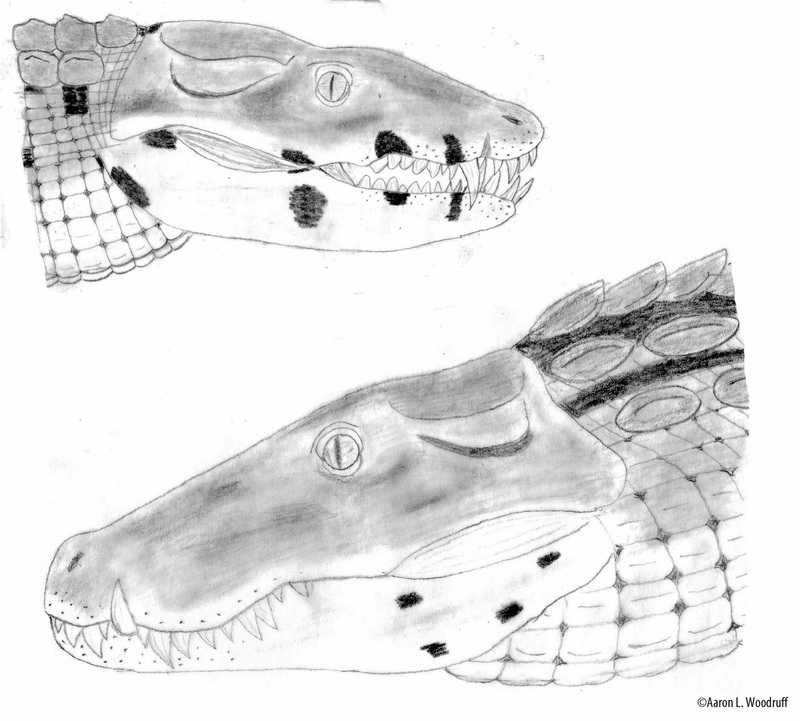 Notosuchians, including sebecids, aren't crocodilians (or crocodylians). Crocodyliform would be a better term. 2. Mekosuchines are a crocodylid lineage. 3. The type species of Pristichampsinae (Pristichampsus rollinati) is a nomen dubium; Planocraniidae is the term currently used for this clade. Thank you. I meant to update this (very old) post a while ago but never got the chance to. I will edit it today. There are other two examples worth reviewing: Paleosuchus trigonatus, the smoothed-fronted caiman, consumes more terrestrial prey than other caimans. Apparently there is a similar trend in at least an species of Osteolaemus. Thanks, I'll look into those taxa!